The bottom row's ground pin is also used of course, for both power and data ground reference. That means, if USB is plugged in, you'll get ~5V USB power. If the feather is running off of battery power, say a LiPoly battery, you'll get 3.7-4.2V power. While this is a little lower than spec, NeoPixels are only a little dimmer. This pin is #6 for Feather 32u4, 328p, M4, nRF52840 and M0s, and is #16 on ESP8266 Feather. You can use the default pin on nearly all Feathers, however you will need to change it on ESP8266 since that pin is not supported by the Adafruit Neopixel library. Its easy to do, just cut that jumper and solder one of the other pins closed. You can get that shifted data pin out on DIN - at the end of the 32-pixel strip, there's also a pin that will let you chain more neopixels on the end. 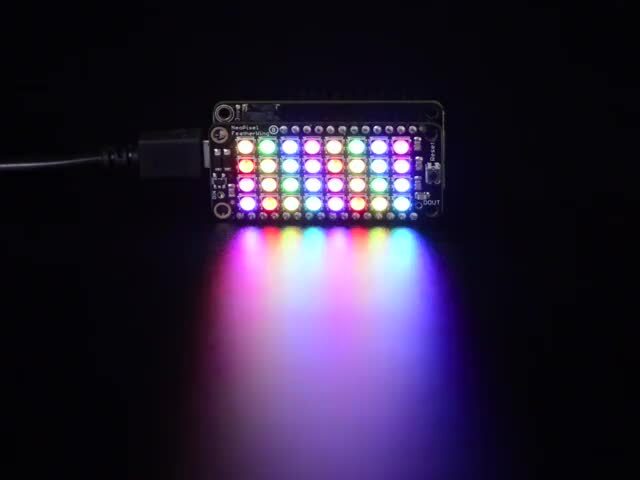 Don't forget to power more NeoPixels seperately, and connect the ground as data reference! This guide was first published on Jan 25, 2016. It was last updated on Jan 25, 2016.